On October 22nd, Silk Road Dance Company performed at an elegant Black Tie Gala held at the Embassy of Egypt and organized by Things to Do DC. The Arabic music ensemble Insijam set the mood with selections of beloved Egyptian songs, including Alf Layla wa Layla and Laylet Hob. 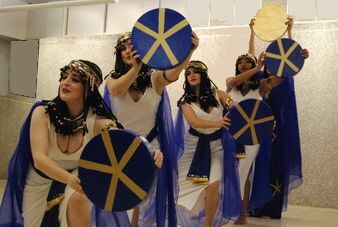 Silk Road Dance Company’s first set included choreographies from EGYPTA: MYTH, MAGIC and MYSTERY, a dance concert with an Ancient Egyptian theme. The opening piece was “Egypt is the Gift of the Nile” and it took place in the Nile with lovely maidens swimming and playing while the hungry crocodile God Sobek stalked them. Next, temple priestesses led a procession with sistrum to welcome the Goddess Isis, the Lady of Magic. Wearing a stunning costume with wings created from over 200 separate pieces of fabirc, Isis enchanted the audience. The God Horus then carried the solar disc across the heavens and passed it on to the Goddess Nuit who, according to Egyptian mythology, swallowed it only to give birth to the sun anew each morning. In the night sky, Nuit danced with the the stars of the evening. 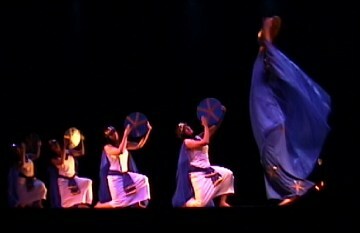 The second set featured Egyptian folkloric dances from the Saiid. Wearing traditional dresses and jewelry purchased in Egypt, Silk Road Dance Company presented the playful and buoyant dances of Upper Egypt. The performance ended with a dramatic and stirring solo man’s dance called “tahtib” by guest artist Ahmad Maaty.